The calendar has flipped to June, and thus ends May, a.k.a. “hell month”. Over the course of May, the Phillies won a mere 6 games – the last time the Phillies had won 6 or fewer games in a month was the June of 1997. The weekly recaps during this forgettable month bear a striking resemblance to thesaurus.com’s entry for “bad”. The Phillies had a run differential of -64 runs, by far the worst in baseball. There are no two ways about it – the Phillies are once again the worst team in the majors. Of all the numbers and stats in baseball, winning percentage is the most important. By winning percentage, they are in last. This kind of losing doesn’t just happen accidentally. I’d like to show just how bad things are with the help of one of my favorite statistics- wOBA. Just some background on wOBA – not every hit is created equal. Despite what batting average would lead you to believe, a home run is much more valuable than a single. This is one of the failings of batting average, in terms of capturing the value of a hitter. OBP does a better job by recording the rate at which batters avoid outs, and OPS does even better by folding in a rudimentary hit value (i.e. Single = 1, Double = 2, Triple = 3, Home Run = 4). With wOBA, it takes things a step further and analyzes how many runs every offensive event is worth. By doing so, it paints a more accurate picture of just how valuable a player is offensively. Here’s a resource for those who want to read more. Not only can we analyze a team’s offense with wOBA, we can also analyze their pitching/defense by looking at a team’s wOBA allowed. This is simply looking at how how other teams offenses have hit against our pitching. By looking at a team’s wOBA differential (wOBA minus wOBA allowed), we can see if a team is under-performing, over-performing, or if they deserve their record. If you have reservations with evaluating a team’s winning percentage this way, here’s a linear regression for wOBA differential and team winning percentage. The sample includes every team season from 2008-2016. 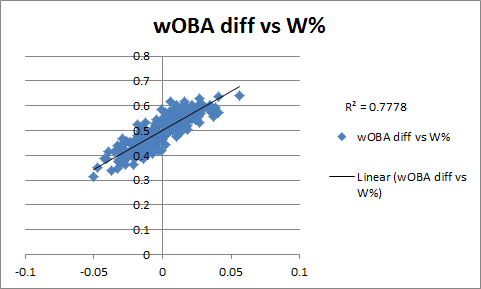 The coefficient of determination is 0.7778, demonstrating a very high correlation between wOBA differential and winning percentage. Now that we have explained wOBA, wOBA differential, and the validity of wOBA differential, let’s see how bad the Phillies are. Looking at the 2017 season, the best wOBA differential belongs to the Dodgers, who have a wOBA diff of 0.066. If they were to keep this pace over a full season, it would be the best wOBA diff ever (well, since 2008, when my sample begins). Next up – Houston with 0.052, Arizona with 0.042, and the Yankees with 0.037. These teams represent the cream of the crop. The Phillies, sadly, are the opposite (porc eht fo mearc?). They are dead last in the majors with a wOBA diff of -0.057. This isn’t just bad – it’s unprecedented. Admittedly, my sample only goes back to 2008, but this would represent the worst wOBA diff ever in that timeframe. The next worst? The 2013 Astros with -0.05. Remember the 2013 Astros? Their full season record was 51-111 (60 games below .500!). Unless the Phillies turn things around, we could be in for the worst Phillies season since 1972. Buckle in, folks. It’s gonna be a long ride. Game 49: Loss, 1-4. It has come to the point that even a 2-run deficit seems insurmountable. The Phillies put together as many hits as the Marlins had runs, which in the Phillies case counts at least as a moral victory. Brock Stassi came in to pinch hit and recorded his first hit since May 14…which ended up being his last hit before being optioned to AA Reading on June 4th. I don’t mind the move; he hadn’t been playing as much lately, and the lack of playing time was having an affect on his production (prior to May 14th, he was getting regular at-bats and hovering around league average offensively). With Red Hot Rhys Hoskins currently entrenched at first base in Lehigh Valley, this looks like the best option for Stassi to get more playing time and re-find his productive swing. Game 50: Loss, 2-7. I wish I could say things went well for Velasquez this game. I wish I could say he found his delivery, harnessed his stuff, struck out 11 and went 7 innings. I wish I wish I hadn’t killed that fish. Wishing alone doesn’t get anyone anywhere- Vinny V was pulled in the second inning with a thankfully minor injury. He was placed on the 10-day DL, and time will tell how long he’ll be out. For the second game in a row, the Phillies had as many or fewer hits as their opponent had runs. Game 51: Loss, 2-10. Aaron Nola’s day lasted all of 3 innings, allowing 4 runs and striking out 4. There are two positives about this. The first – his short outing was a result of ineffectiveness, not injury. He’ll be back at it next Tuesday, hoping to put this short start behind him. The second positive is that almost nobody was there to witness his poor start. I mean it – 1,590 fans attended the game, the least attended game since 1989. I scanned quickly through the broadcast and the usual between-inning shots focused on the roof or outside, rather than show a sea of empty blue seats. Behold, the drawing power of two floundering teams playing a matinee game in Miami on a Wednesday. Game 52: Loss, 0-10. The Phillies walked opposing pitcher Ty Blach three times, which is three more times than the entire Phillies lineup walked. That should tell you all you need to know about how this game went. Game 53: Win, 5-3. With the injuries piling up and a short supply of quality options to choose from, the Phillies called up Ben Lively to make his major league debut. Despite a lack of strikeouts, he was able to go 7 innings and only allow a single run by keeping the ball on the ground and limiting quality contact (.226 xBA, 82.6 MPH average exit velocity vs. 86.9 MPH league average). If he even turns out to be an OK back-end starter then we’ll have to reluctantly mark it down as a win for Ruben Amaro Jr, as the cost to acquire Lively was only Marlon Byrd’s age-37 season. Game 54: Win, 9-7. The Phillies won back-to-back games for the first time since April. Jeremy Hellickson didn’t have his best stuff, walking 4 and allowing a pair of dingers. For once, the offense picked up the pitching staff – the Phillies won despite allowing 7 runs, bringing their season record to 1-15 in games where they’ve allowed 7 or more runs. Recently, there’s been a worrying trend to refer to home runs as “Dongs”. For the most part, I am against this – baseball has enough innuendo as is, it does not need any help. However, there are cases when I can give the term “dong” a pass. Josh Donaldson hitting a home run with his fly down is among these cases. The Phillies may be (un)comfortably in last place, but fans can always depend on the Phanatic to bring them joy. I have to imagine the Phanatic was the one behind the camera for this instant classic. Albert Pujols hit home run #600 in grand fashion. Just a reminder that even with half a decade of disappointing play, he’s still one of the all time greats. With another 2-win week in the books, things are looking up for the Phillies. What a sad, sad sentence to type. < Previous Week 8 Recap: Two Wins!